Rahman uses 80 instruments to give Bharatbala a symphonic version of Jana Gana Mana. He’s the voice, brains, soul and the music behind some of the most memorable tunes of our time. And when A R Rahman isn’t spinning out songs that have propelled him to the rarefied ranks of the world’s top 25 selling artistes, in between flicks of the scrollwheel on his P990 smartphone (BT caught him en route to an album launch at a suburban mall), he talks about freedom. Think Jana Gana Mana , and think India in all her avatars, and that’s what inspired the Bharatbala-Rahman combine to create audio and visual renderings of the National Anthem, originally penned by Rabindranath Tagore. This album, released on Times Music, is a tribute to the feeling of pride and unity evoked by the anthem. “India’s progressing very well economically but there should be more tolerance. People need to have balance in whatever they do,” Rahman muses. Four years, to be precise. And it’s not just Rahman who’s added his prodigious talents to this project. 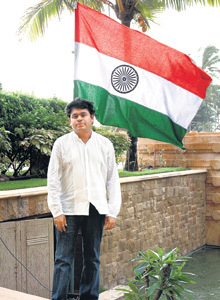 That singular emotion of patriotism has been rendered by the likes of Pt Bhimsen Joshi, Lata Mageshkar, Pt Jasraj, Asha Bhonsle, Pt Hariprasad Chaurasia, Ustad Amjad Ali Khan, Pt Shivkumar Sharma and Jagjit Singh, to name a few. And indeed, there’s no song which thrills the heartbeat of a nation as successfully as our anthem. “It is important to give people what they love,” says the maestro. And what does he listen to when he wants peace? “Sometimes, it’s just pure classical like Andrea Bocelli,” he says. This entry was posted on Sunday, August 12th, 2007 at 1:47 pm	and is filed under Flash news. You can follow any responses to this entry through the RSS 2.0 feed. You can leave a response, or trackback from your own site.